At the Eighteenth Congress of the Chinese Communist Party (CCP) early in the fall of 2012, China will formally begin the last phase of the transition to a new cohort of party leaders, what by the now conventional reckoning is referred to as the “fifth generation”.’ The party congress will be the first step in inaugurating these successors, with those heading the government to be announced at the subsequent National People’s Congress in early 2013, and the transfer of civilian leadership of the military (Chairman of the Central Military Commission) possibly taking another year or more. But in China’s political system the selection of a new CCP politburo standing committee, especially its leading figure, the party’s general secretary, is the key step in the succession process. Based on the current posts he holds and the role he has recently played in ceremonial activities at home and abroad, the consensus is that Xi Jinping will be the man to head this next generation of political leaders in China. What are the implications of this leadership transition for China’s foreign policy going forward? Do the personal backgrounds or professional career trajectories of the individuals in this cohort suggest they will have a distinctive set of foreign policy views? 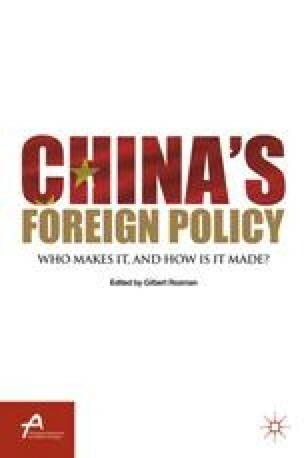 If so, are their views likely to change China’s foreign policy-making process or the policies it produces? Avery Goldstein is the David M. Knott Professor of Global Politics and International Relations in the political science department, director of the Center for the Study of Contemporary China, and associate director of the Christopher Browne Center for International Politics at the University of Pennsylvania. Professor Goldstein is also a senior fellow at the Foreign Policy Research Institute in Philadelphia, where he served as the director of the Asia Program from 1997 to 2002. His areas of specialization are international relations theory, security studies, and Chinese politics. His publications include Rising to the Challenge: China’s Grand Strategy and International Security (Stanford University Press, 2005) and Deterrence and Security in the 21st Century: China, Britain, France, and the Enduring Legacy of the Nuclear Revolution (Stanford University Press, 2000). He received his B.A. in political science and M.S. in secondary education from the University of Pennsylvania, and M.A. and Ph.D. in political science from the University of California, Berkeley.